From left to right, Pat Brisson, Pamela Swallow, Kay, Joyce McDonald, Sally Keehn, Wendy Pfeffer, Pamela Jane, and Elvira Woodruff. 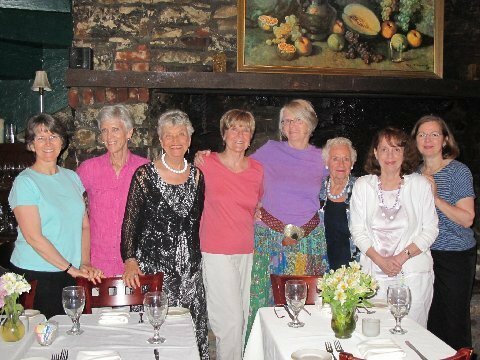 Lunching recently at the Riegelsville Inn on the Delaware, our writers group celebrated the birthdays of three of our members. For a writer, having a good group is almost as essential as having a computer. Who else will listen patiently to a really rough draft? Who else will say kindly but firmly, this isn't working for me yet? Who else will light up with delight when wonderful work is shared? Who else keeps us going when times are tough and the market seems hopeless? Here's a toast to our writers group...Salute. Yes, we learn: from our writers groups, from experimentation with various genres, from listening to speakers at conferences, from networking with editors and other writers at conferences and conventions, and from examining new books at the bookstores. But can published authors learn more about writing, researching, and shaping books? Of course we can - and should (in our humble opinions). We need in-depth sessions on craft with solid content, possibilities for feedback, and references to take home and ponder. Being published may mean "you’re there". But it doesn’t mean "you’re finished". Being published isn’t the end of learning - it’s just a great beginning of new things to learn, new ways to work, better ways to play with words, arrange ideas - and elevate your writing and your career. We are particularly lucky in Pennsylvania because the Highlights Foundation offers workshops for experienced writers. They have put together, at their Honesdale location, a series of workshops that so far have included: Writing the Novel with Patti Gauch, a poetry workshop with Rebecca Dotlich, Life in the Spotlight with Peter Jacobi, and Andrea Early, which focuses on school visits and composing presentations, and Writing the YA Novel with Rich Wallace and Tracy Gates. Recently we attended Mixing Imagination with Research – a seminar facilitated by Carolyn Yoder, with guest speakers Ellen Levine, an award winning non-fiction author; Beth Levine, an Editor with Scholastic who works on the Dear America Series; and Judy Burke, an associate editor at Highlights who specializes in history. The seminar began with an assignment: Write a rough draft (1500 words) of a historical fiction (or non-fiction) story that you find in your own backyard. The person/place/event had to be more than 50 years old (as in died or happened more than 50 years ago) and had to have national kid-appeal. But we didn’t have to turn in just the writing; we had to turn in a detailed bibliography, a journal of notes on doing the research, a summary, and an outline. Horrors! We don’t have time for this! And we’re paying them! We fussed. We fumed. We panicked. We told each other: We’re going to learn. We told each other: We want to learn better ways to find primary sources, pictures, how to evaluate the accuracy of these materials, how to use the Internet more effectively, how to use historical events and people and weave a story around them. And there it all was for us to discover in the assignment. So we went to work (separately, but with lots of phone calls in between!). We quickly discovered that the assignment taught us what questions to ask when we arrived, what details to focus on, where difficulties existed as we attempted to follow the above instructions and create a living, singing manuscript. By the time we sent in our packets, we knew we had gotten our money’s worth. And we hadn’t been to the workshop yet! We arrived in Honesdale on a beautiful fall day. We settled in. The cozy cabins came complete with bathroom and all amenities. We were ready to move in permanently until we discovered no phone and no cell phone towers. But the better to get work done, right? After a sumptuous dinner (We all wanted to take Dominic home with us at the end of the four days), we got down to work. First there was Carolyn Yoder, Writer and Editor for the New Jersey Historical Society, Senior Editor of history for Highlights Magazine and Boyds Mills Press, Former editor of Cobblestone, Executive Director of the New Hampshire Antiquarian Society, and Writer of historical fiction and nonfiction. She’s been there. Done that. And was willing to tell all! Then there were the conferees. From Maine to Alabama they came bringing their manuscripts, their questions, their accents, their sense of place, their point of view. There were teachers, a dairy farmer, an archaeologist, a genealogist, retired teachers, freelance writers, and even a financial analyst (who, sadly, gave us no tips on the stock market). Next Ellen Levine mesmerized us with her accounts of doing oral history: interviewing kids who made a difference in the Civil Rights Movement, citizens who made a difference in Denmark as they hid the Jews from the Nazis and risked life and limb to do so. We came away believing that Ellen and her books made a difference, as she wrote about evil and ignorance, and showed how human beings stepped forward and changed their world and ours. We asked lots of questions about interviewing, checking, getting people to answer your calls. She generously gave us advice, and encouragement. Beth Levine, editor at Orchard and Scholastic, spoke about publishing non-fiction, and historical fiction. She used Dear America as examples, reading passionately from her favorite historical fiction novels. Judy Burke, Associate Editor of Highlights, bowled us over with her enthusiasm for history, her job, and the editing process. If we could only bottle that, we thought. That night we had dinner with people from Boyds Mills and Highlights, including Kent Brown and Larry Rossler. Get a good night’s sleep they told us because tomorrow… And were they right! Saturday the Critiques began. From 8 am in the morning ‘til 1 am at night and the next day from 7 am to 2 pm – we heard each manuscript and each conferee offered detailed comments. It was fabulous (and yes, it was hard work). In between, Carolyn Yoder talked about sources, resources, offered her own critiques and tips. At the end she sent us home with handouts two inches high. The learning was just beginning. As we left Honesdale, we lived and relived the workshop, read the handouts out loud, and collapsed at our respective home places, knowing we were richer, more knowledgeable, and better able to Mix Imagination with Research! To get on the mailing list for future workshops, email: contact@highlightsfoundation.org and ask for Honesdale Workshop Information. Originally published in Pen and Ink – SCBWI-Eastern PA. Newsletter.